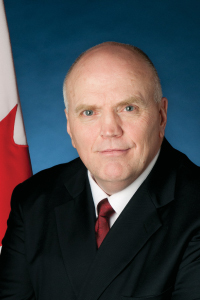 After serving for almost 31 years as a police officer, including working in three provinces for three different police agencies, Vernon White was appointed to the Senate of Canada in February 2012. At the time of his appointment, Vernon was also studying his Doctorate of Police Leadership with CSU’s Australian Graduate School of Policing, graduating in 2013. With a strong belief in education and several university qualifications, the Senator is passionate about teaching and mentoring police officers on the importance of education on top of their training. Here he gives an insight into the role education has had in shaping his life. I am not the first university graduate in my family.... however having become a police officer without a university degree and then spending 22 years obtaining my undergraduate and graduate degrees followed by my Doctorate showed my family what commitment means. At school I... found the education to add to my experience that made me a better police officer and community member. My childhood was... rough. I grew up in a coalmining town in eastern Canada and very few of my friends went on to university so I was one of the lucky ones to have had the opportunity. As a child I was most curious about... what life would be like in other parts of Canada. I have been lucky enough to work in 16 different communities as a police officer. I chose CSU because… I felt it would allow me to advance my education learning from professors with vast experience and knowledge. My best experience at CSU... my Doctorate thesis. My worst experience at CSU... my Doctorate thesis! At university I was inspired… by those I was engaged with - every time. Today I’m motivated… whenever I deal with current students as they have found the path I found myself on. I’m also motivated learning from an academic institution that is renowned for advancing the knowledge of policing and security. In my profession it is important to… be committed, dedicated and to have integrity. I never dreamed I would… graduate from university. The biggest influence in my life... my father. He was a coalminer with grade four education and he inspired in me work ethic and integrity in everything I do. I’m most proud of… having brought two drug treatment centres to Ottawa for youth and working with community leaders. In the future I’d like to… continue to be involved in my community and the policing community as an educator. The best piece of advice I ever received... was to always work on adding tools to your toolbox. The single-most important issue in the world is… safety and security. The thing I wish I had done but never got around to... was to work in a foreign country as a peacekeeper/police officer. If I could do it all again I... wouldn’t change a thing. I try to live without regrets. One last thing... I think working in policing for more than three decades has allowed me to see some of the worst things possible but I have been lucky enough to see people do extraordinary things for others.